A unique and fun fitness style using an aerial silks hammock for core strength, flexibility, and posture. Zina DiTonno, Trainer and Instructor, brings Aerial Fun and Fitness to the Newark, Wilmington, Pike Creek, Delaware DE areas. In a fitness rut? Try Aerial Fitness a unique fun fitness style (and get some new brain cells as well) using an aerial silk hammock or silk loop to improve core strength, flexibility, and posture. One hammock many styles - gentle and restorative, fun and flying, or power and strength. Something for everyone. Join us for the latest fitness fun. Want to know what we are all about? Watch the video see us all in action. We have way too much fun being strong. Almost anyone can do this - you can move through stretches, build strength, improve balance, being totally supported. Engage the world in a new a fun way, yes even build brain cells and strong core. One Hammock. Many Styles. Gentle or flying something for everyone. Video Production by Julie Elliot. It’s includes yoga style fitness to supension training, It's Aerial Fitness, Gentle and Low Hammock and for others we have added acrobatic elements - think circus fitness! 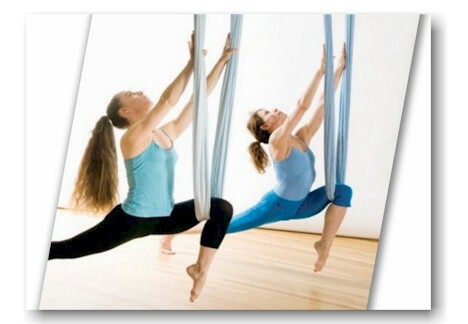 Aerial Fitness and Aerial Yoga is accessible to all body shapes and sizes. It uses and integrates floor poses from traditional yoga, Pilates, stretching, and fitness based moves while using a hammock to counteract gravity and create a fun experience. As a result, this suspension style of exercise combination relieves compression from the neck and spine. Similarly allowing you to stretch and strengthen without over stressing your joints or vertebrae. Ultimately, aerial is a form of therapeutic yoga style exercise, ideal for alleviating back tension and daily stressors. In a world where technology demands our attention we strain our body and mind, compelled to read every email. Consequently, forgetting to relax from our fast pace lifestyle and unable to manage stress. Even health care professionals, like Dr. Oz, recommends daily yoga style stretching for coping with reality by rejuvenation of the body and mind. New participants will build trust with sitting in and stretching with the hammock at their own pace. Above all, gravity, poses and a hammock provide; natural deep stretching, proper alignment, gently adding traction effects and inversions without straining joints. Did we mention the muscle toning side benefit? Therefore Aerial Yoga and Aerial Fitness allows participants with prior yoga or fitness backgrounds knowledge to quickly become familiar. While, unfamiliar yoga participants or deconditioned individuals will immediately feel these natural benefits. We must admit Aerial Fitness has a playful spin compared to floor yoga or the traditional gym exercises truly providing a fun experience. If you are tired or bored of the Gym give this a try. Sign up for a class at Aerial Fun and Fitness Studio established by Zina DiTonno. Her Aerial Fitness program is adapted from VaihAyasa based program. Now, Zina is launching the only hammock style aerial fitness and aerial yoga style fitness studio to the surrounding areas of Hockessin, Pike Creek, Wilmington and Newark. Her studio is located at the Meadowood II Shopping Center on Kirkwood Hwy. Conquer your day! We were excited to be voted as Winner for Most Happening List Group Yoga and Finalist for Group Exercise. 2 YEARS RUNNING!! 2016 and 2017. AERIAL THAI - Let us take care of you! Stretch away your stress and relax with Aerial Thai (TM). This is a unique, multi-dimensional approach to a holistic lifestyle. AT provides a supportive, freeing session which promises to relax both body and mind. The support of the aerial hammock allows a sense of security while the practitioner gently rocks, shakes, pushes and pulls the client into deep states of relaxation and calm. Sessions end in a supported cocoon to melt away the last bit of tension. Semi-Private classes on the schedule. Private Sessions by appointment. Ann Marie, Janice, Kathleen, Nicole, and Zina all went thru the training together. Click the blue link above to sign up for a semi-private class. Some of our testimonies already coming in: my hips felt so open and relaxed; My knee pain was less; I felt so good the next day. So relaxed. Energized for the next day. AERIAL THAI available for private bookings to Stretch deeply and destress, Let us support you - Contact us here for a semi-private or private session. Your favorites; Aerial Barre and Conditioning on every 3rd friday 6pm. Student Showcase In May! They are amazing and what they have accomplished. Look for the videos on our Facebook Page After Monday May 5th. See some of our previews for upcoming fall classes. IT IS HERE! Bungee Fitness! Sep 1st! We are jumping joints friendly fitness. Click here to read all about it and sign up for classes!! Come bounce on our new gymnastics floors. Your favorites; Aerial Thai - Let us take care of you! Stretch away your stress and relax; Aerial Barre and Conditioning on every 3rd friday, Hulu Hoop Fitness 1st and 3rd Sat morning; Lyra Mixed level on 2nd and 4th Sat afternoon and Sports and Thai Massage on Friday mornings. Book a private Party at either location Newark DE or Phonenixville PA.
About Our Phoenixvile, PA location! DURING THE WINTER MONTHS - SCHEDULE CHANGES OR CANCELLATIONS FOR GROUP CLASSES WILL BE LISTED ON THE CLASS CALENDAR.